When you normally pack your child’s lunch, you’re probably thinking about both nutrition, variety, and taste. A big worry most mothers have is whether or not they will have to sacrifice one of those three for the sake of a good lunch their kid will actually eat. You certainly want your child to grow up healthy and strong, learn to enjoy a variety of foods, and enjoy what their mom is packing them daily. However, over time, it may feel like a simple issue is becoming a big problem. Oftentimes, moms will yield and give in to the easier softer way and just pack their child a packaged, processed Lunchables lunch. This may be a tempting solution, but don’t quit on providing your child with a healthy, delicious, nutritious, and unique lunch with your own ideas and ingredients! Funnily enough, it’s actually not a bad idea to take a play out of Lunchables’ playbook and create your own lunchable lunch for your kid! Only this time, you can do it the right way with the right ingredients and a unique style, perhaps using a container such as a bento lunch box. Here are the Top 7 DIY lunchables that you can pack for your child every day that they are sure to love. Ever seen those bistro boxes Starbucks sells in their store? Such a cool, unique idea right? They offer two or three different food options all in the same box, and if you get to a Starbucks in the afternoon, they’re mostly all gone! Why is this? Well, they simply pack healthy, delicious ingredients into a small lunch box with classic recipes like sandwiches, wraps, veggies and dips etc., that are conveniently placed in a small, tight box that appeals to almost anyone. You can do the same thing and create your very own bistro box at home! All it takes are a few hard boiled eggs, dip, celery sticks or carrot sticks, cucumber slices, grapes or blueberries, and a small piece of cheese. Toss them all into different compartments in a container and there you go! You have your very own protein bistro box! The best way to organize the foods and make your lunchable is to use a bento lunch box. You can alter this recipe any way you choose, all you need to start is a half of a bagel, some shredded cheese, and tomato sauce in a cup. You can add other foods to make your own pizza lunchable, such as apple slices, celery sticks, crackers or anything else you can think of. Your son or daughter is sure to enjoy making their own pizza bagel and might even make the kids who bring regular, packaged lunchables jealous! Use a bento lunch box to make it even more perfect. This one is a fairly simple lunchable, you only need small slices of meat that can fit onto crackers, some small slices of cheese and any variety of cracker. You can throw in vegetables as a side dish for this lunchable as well, along with some fresh fruit or peanut butter. This might be one of the simplest DIY lunchables to prepare, so why not give it a shot? Your kids will enjoy a satisfying meal that will keep them full for the rest of the day because of a high protein lunch and will energize them to be more alert and focused during their class lessons. Use a bento lunch box to separate all three ingredients so your kids can mix and match their food the way they like!? You can’t go wrong with a simple sandwich for a lunchable. However, the best way to go about making a homemade lunchable sandwich is to cut it up into mini triangles and toss them into a bento lunch box with some other sides. With a lunchable idea as simple as this one, you have room to prepare whatever kind of sandwich you want, hopefully one with fresh ingredients that your kids will enjoy. Try the classic peanut butter and jelly, ham and cheese, or chicken salad. If you want to get even more creative however, you can go with turkey and pepper jack cheese with roasted red peppers, chicken pesto, or any other delicious sandwich with tasty nutritious ingredients. Along with a sandwich, include some sliced veggies, crackers, fruits, or dips to fit into the other compartments of a bento lunch box. 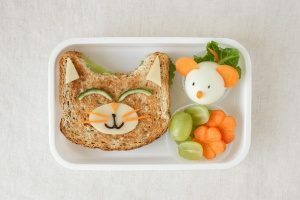 This lunchable is sure to keep your child happy and full with a creative and fun lunch to eat! A pasta DIY lunchable will take a little bit more preparation time but it is well worth the effort. A pasta dish like spaghetti, or one with pesto, or alfredo sauce and chicken is a fantastic lunchable idea. Include some sides as well, like steamed vegetables and fruit for a perfect lunch. Using a whole grain pasta instead of a regular variety is a good idea. Whole grain pastas will fill your child up with good carbohydrates that will keep their energy levels high all day. Using A bento lunch box is a great way to organize this lunchable. You can separate the pasta and sides so they don’t mix together and each stays fresh in its own compartment. You may not have thought it, but you can actually make a meal entirely out of fruits and vegetables! If you get creative enough, you can include ingredients such as apples, blueberries, mangoes, oranges, broccoli, cauliflower, celery, carrots, etc. The list is endless! You can even include some unconventional fruits and vegetables like starfruit or artichokes to promote your child to trying new foods and new things. This DIY lunchable may be one of the healthiest options out of them all because it only includes fresh, non-processed ingredients, and obviously, using a bento lunch box to prepare this lunch is the only way to do it. While the idea of leftovers may sound unappealing, selecting the right mix will make for a great lunchable. If you’ve already had a long day and don’t want to make the effort to make your kid’s lunch, then feel no shame in using leftovers. You probably already made a great dinner, so it will likely make for a great lunch tomorrow. Using a bento lunch box will help keep last night’s dinner fresh for your child, and they will be happy knowing they won’t spill their lunch all over the floor like some of their friends may suffer through. With all these lunchable ideas, you might find it hard to get the perfect container that will fit all the foods and recipes you are ready to make snugly and freshly. Introducing the bento lunch box, the ultimate solution to a messy lunch problem. It will hold all food separately in different compartments and will keep food fresh for the entire day. This waym you won’t have to worry about putting a lunchable into separate containers, which will allow your child carry it around easier. 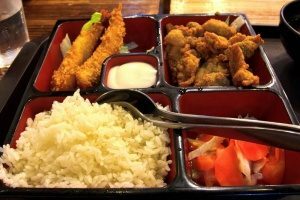 Consider a bento lunch box as the best way to an amazing homemade lunchable!